Lose yourself in some of Ireland's most inspiring countryside and vibrant cities on this self-drive tour. This fabled isle is a place where history & legends intertwine to create a captivating scenery that can't help but capture your imagination. Stay at hand-picked accommodation during your adventure, and enjoy entrance and tastings at Jameson Distillery Middleton and Guinness Storehouse Dublin! Want to visit a captivating country with beautiful landscapes? A land of myth and medieval history, of crystal clear lakes and rugged white cliffs, vast green meadows and ancient woodland... Discover it all on this guided tour! Beginning in cosmopolitan Dublin, you will have the chance to visit some of the Emerald Isle's most famous sights - kiss the Blarney stone, visit a whiskey distillery and marvel at the beautiful Killarney Lakes. Day 1: Welcome to Dublin! Arrive in Dublin. In the afternoon, take in the attractions of this cosmopolitan capital. Don’t miss Trinity College, the Book of Kells and of course you’ll have to make sure to visit the world-famous Guinness Storehouse. The lively and vibrant Temple Bar District - Dublin's Cultural Quarter, is well worth a visit. Temple Bar has preserved its medieval street pattern, with many narrow cobbled streets. The area comes alive after dark, with many pubs, restaurants and nightclubs to choose from. Take part on a Musical Pub Crawl. Today travel to Kilkenny via the Wicklow region known as the Garden of Ireland. A visit to Glendalough is a must. The sight not only boasts some stunning scenery, but also a world famous Monastic Site with Round Tower and a selection of walking trails, including The Wicklow Way. Continue on to Kilkenny where you can visit the Smithwick's Experience. See the working factory of this famous ale and learn about its interesting story. Also included in the tour is a visit to St. Francis Abbey, which dates back to the 12th Century and can be found on the same site as the brewery. 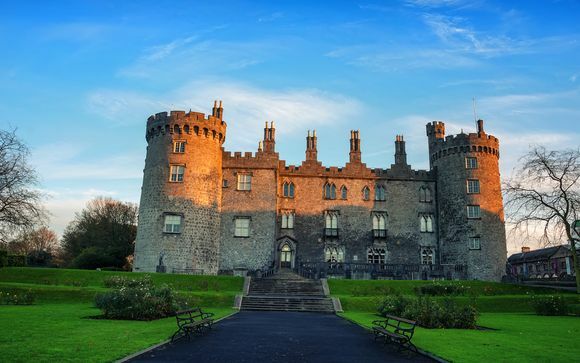 Kilkenny is often referred to as the medieval capital of Ireland and after visiting Kilkenny Castle you’ll know why. Dating back to the 18th Century this intricate structure boasts a variety of contrasting styles of architecture. Kilkenny is a home to the medieval mile and you’ll find plenty of cosy pubs to visit along it! Do not forget to try the local beer, name after the City : Kilkenny beer! Today make your way to Cork. On your way there visit the impressive Rock of Cashel which is a towering complex of 12th and 13th Century buildings featuring a combination of Celtic and medieval architecture. Formally known as St. Patrick’s Rock or The Rock of Kings, this was a site long held in revere as the seat of the High Kings of Munster. 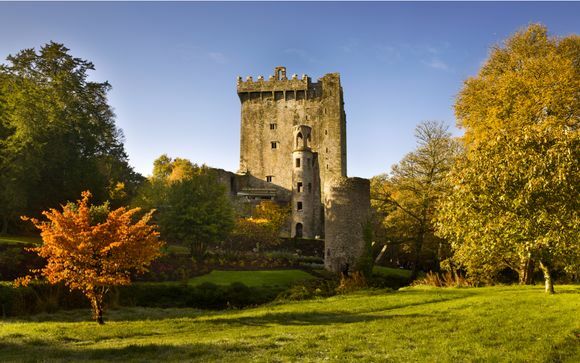 Don’t miss the opportunity to kiss the Blarney Stone in Blarney Castle. Legend has it that planting a kiss on the Stone of Eloquence will endow you with the gift of the gab and you’ll never again be lost for words. Arrive in Cork City. The Franciscan Well Brewery runs tours in the evenings from Monday to Friday. In case you miss the tour, the pub itself makes a great visit with its extensive range of craft beers, ales, lagers and stouts. While you are in Cork, enjoy your tour of the Old Midleton Whiskey Distillery where the famous Jameson Irish Whiskey is produced! Of course, a free tasting of this divine liquor is included. Travel from Cork to Killarney. 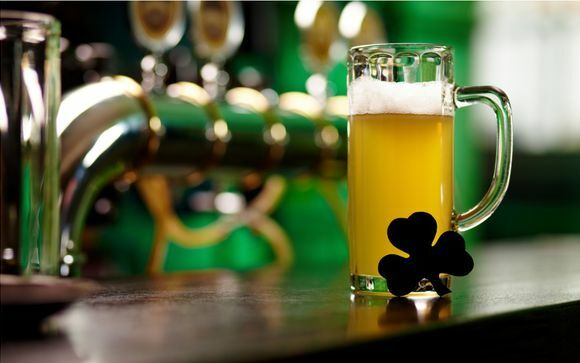 Visit the Killarney Brewing Company where you will get a chance to see their Brewhouse up close and personal. Watch an introductory video, take a tour of the brewery and you’ll of course get a chance to sample their beer as well! 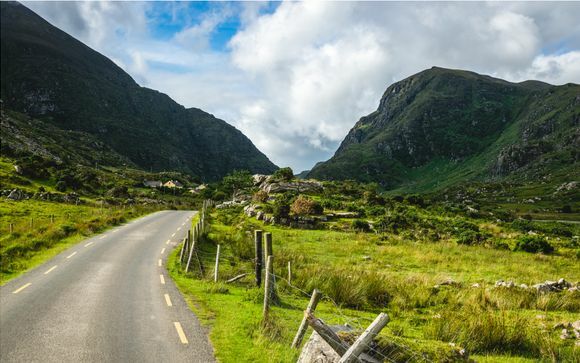 Drive around the famous Ring of Kerry. 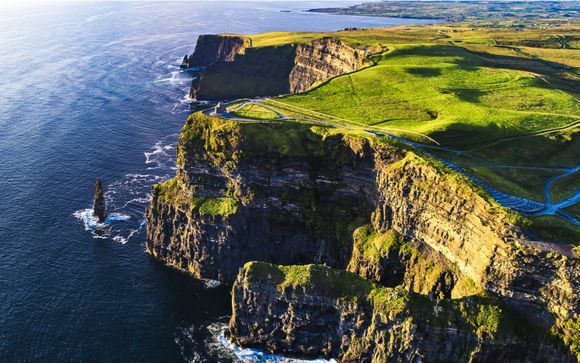 From expansive beaches to rich heritage links to ancient Ireland and some of the finest scenery in Ireland, this is one day trip that you will not be forgetting anytime soon. Venture along the pass through the majestic MacGillycuddy’s reeks, visit the restored Bog village, admire the roaring Torc Waterfall or take in the panoramic views from Ladies View. In the evening check out some of the many lovely pubs Killarney has to offer. 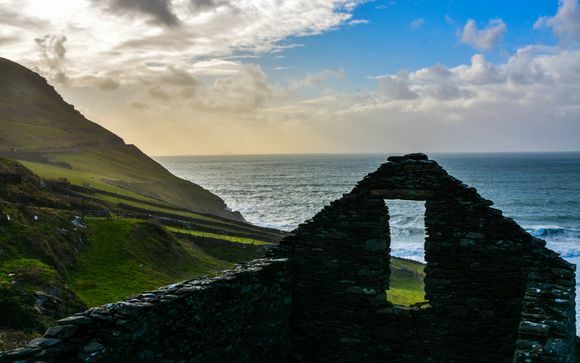 Today visit the Dingle area which was once voted as the “most beautiful place on earth” by the National Geographic. This area is blessed with a treasure trove of archaeological and historical sites dotting the beautiful landscape of the peninsula. 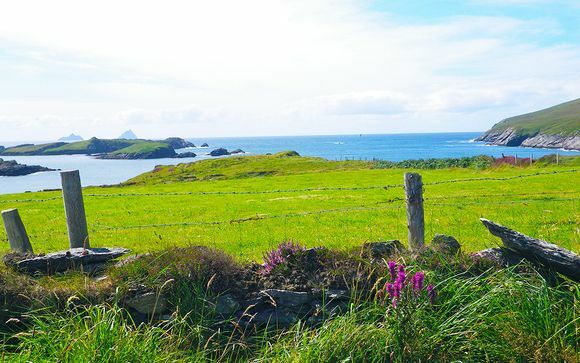 The peninsula has some of the most beautiful coastal drives you will ever experience in Ireland. It’s a home to the mountain range of Slieve Mish, Ireland’s second highest peak (Mount Brandon) as well as various cliffs fronts and beaches. Make sure not to miss the Slea Head drive and the exhilarating Conor Pass. Visit the Dingle Brewing Company where you can tour the brewery and learn all about Tom Crean, a famous Irishman who took part on Scott’s expedition to the South Pole. Today make your way to county Clare. En-route drive through the postcard-pretty village of Adare with its thatched roof cottages. Visit Bunratty Castle – a 15th Century castle, which is the acclaimed setting for the 19th Century Bunratty Folk Park. Built in 1425 and restored to its former medieval glory in 1954, it is the ultimate medieval fortress in Ireland. The Cliffs of Moher are one of Ireland's top Visitor attractions. The Cliffs stand 214 metres tall at their highest point and range for 8 kilometres over the Atlantic Ocean. From the Cliffs one can see the Aran Islands, Galway Bay, as well as The Twelve Pins, the Maum Turk Mountains in Connemara and Loop Head to the South. There are two paths to take north and south along the cliff edge, providing spectacular views all the way. Visit the village of Doolin known for its traditional Irish music and cosy pubs. It’s time to travel back to Dublin. On your way visit Clonmacnoise. This important monastic site is home to fantastically crafted stone crosses, the ruins of a cathedral and two round towers, which reach to the heavens. Visit Athlone Castle which history can be traced to the 12th century. The eight newly designed exhibition spaces pursue both a chronological and thematic sequence, combining hands-on and fun experiences that will appeal to both children and adults. Athlone is also a home to Sean’s Bar which is officially the oldest pub in Ireland and one of the oldest pubs in the whole world! Continue on to Dublin for your last night’s accommodation. Slán abhaile!! Morning at leisure to either shop for those souvenirs on Grafton Street or spend a few hours taking in more of all the wealth of attractions that you may have missed earlier. Please note that if these hotels are not available hotel of a similar standard will be found. Car Hire: Car Hire is included in this offer. Pick up and drop off at Dublin airport. For more information, see the 'Details' section. Drivers must hold the driving licence minimum one year. Optional insurance: PAI (Insurance for passengers and luggage) 5,50 per day + tax – to be paid by credit car. The flight inclusive offer(s) shown on this page are ATOL Protected by the Civil Aviation Authority. Voyage Privé is acting as agent for Cosmos Tours & Cruises with ATOL number 2275 and your contract is with that company.